Alliance LED High Bay Luminaire comes with optional decorative caps. Alliance LED High Bay Luminaire is available in 2 ft and 4 ft length which offers efficacy up to 163 lumens per watt. Unit comes in 16 standard lumen packages and is equipped with clear and frosted lenses which are made of acrylic or polycarbonate materials. Product can be operated in a temperature up to 55 degree C and offers color temperature options such as 3500K, 4000K & 5000K. 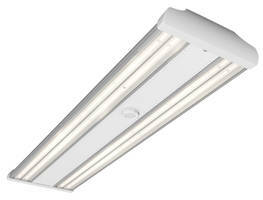 Luminaire is offered in 10 watt and 20 watt EM options and comes with 5 year warranty. LSI is excited to announce the official launch of its latest innovation, the AllianceT LED High Bay (ALI). This original, American-manufactured and designed luminaire distinguishes itself as Best-In-Class across many criteria important to specifiers and design-build contractors. The maximum efficacy across these 2 foot and 4 foot fixtures is an impressive 163 lumens per watt. But more impressive are the numerous configurable attributes that make LSI Alliance High Bays easy to specify, such as 16 standard lumen packages, programmable drivers for custom lumen packages, and multiple distributions, lenses, CCTs, mounting alternatives, emergency backup options and controls choices. This makes LSI Alliance LED High Bays flexible for use in applications from school gymnasiums to industrial facilities and more. Optional decorative end caps also expand the settings in which the Alliance can be an ideal choice.